Sometimes affordability means sacrifice – but not at the Marcon Cornerstone condos in Langley real estate market. We’ve included everything you’ve come to expect, and more, in these well-designed one- and two-bedroom Langley condominiums. And most importantly, you don’t have to wait long – move in as early as fall 2011! The Cornerstone condos in Langley by Marcon Developers stand out, proudly sitting atop a lushly landscaped stone podium. The Rositch Hemphill Architects’ design where stone turrets unite with solid timber beams, is classic with a contemporary twist. Inside these affordable yet boutique condos in Langley real estate market, the feel is decidedly more contemporary, never losing touch with the overall warmth that makes Cornerstone condos unique. From the impressive two-storey lobby, to the lush landscaping, common gardens and children’s play area, Cornerstone Langley real estate development has thoughtfully been assembled by Marcon and their team of expert consultants. Yes, the Extras are ALL Included Here at the New Langley Cornerstone Condos for Sale! Look around… see all the extras? Yes they are INCLUDED! Stainless steel appliances, floating fireplace, laundry and expansive balconies are all yours if you choose Cornerstone condos in Langley as your new home. And it’s hard to miss those mountain views of the distinctive Golden Ears and the impressive Mount Baker – you can have those, too. The most impressive thing is the name behind it all – Marcon. As one of the most respected builders in the province, with 26 years in business and over 7500 homes built, quality and reliability are a given. Here at the new Langley Cornerstone condos by Marcon, home buyers can be confident that they are purchasing a new apartment home that is well designed and constructed, backed with a home warranty. 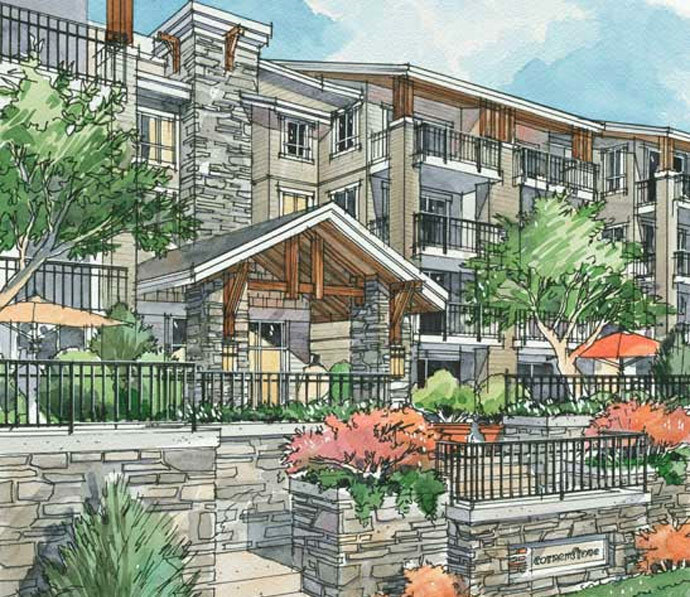 So Where are These Boutique Yet Affordable Langley Condos at Cornerstone Living? Located at the corner of 210A and 56th Avenue, Cornerstone condos in the hot Langley real estate market is set back from the street on a lushly landscaped site, offering views of the mountains all around. The Cornerstone Langley City centre location is ultra-convenient, with many neighbourhood amenities within walking distance. Kwantlen University, Newlands Golf and Country Club and three of the city’s 40 parks all accessible on foot. Need to hop over to Vancouver Island? The airport is just a hop skip and a jump away, too, with direct flights to Victoria several times a day on Harbour Air. Minutes away from your new home here at Cornerstone Langley real estate development, you’ll find some of your favourite restaurants and shops – Earl’s, Brown’s, Willowbrook Mall, Safeway and Costco are all in your neighbourhood. Or perhaps take advantage of the rural setting and pick up produce from the roadside farm stands, visit a local winery or cheeseworks for something really fresh! You get the best of ALL worlds by living here at Cornerstone Condos in Langley BC. The new Langley homes themselves are thoughtfully laid out and designed to endure the test of time. Gannon Ross Designs has carefully created a contemporary living space, right down to the smallest of details. Cabinetry, flooring and matching mantle at the new Langley Cornerstone apartments are made from highly durable materials, in warm wood tones to create a unified look that will never go out of style. From the floating fireplace to the oversized balconies, and the extra-capacity washer and dryer, Cornerstone Langley apartments for sale have been designed to make day-to-day life so much more enjoyable and convenient. We’ve included everything – yes, even the under mount kitchen sink! Cutting edge kitchens at the affordable Langley Cornerstone apartments for sale showcase clean, square line cabinets with modern, linear frosted glass accent and wine rack. Rich, ¾” thick, polished stone slab countertops are accented by hand-set, layered pattern, full-height modern 6” x 24” gloss tile back splash. Sleek “Level” series faucets by Moen with integral pullout sprayer with a “Sonetto” double-bowl, under mount stainless steel sink are highlighted by the brushed nickel track lighting with under-cabinet accent strip lighting are all standard at the new Langley condos for sale at Cornerstone by Marcon Developers. The modern “Stainless Series” Whirlpool®appliances including: full-size Energy Star® 18.6 cubic foot, bottom-freezer refrigerator with glass shelves and humidity-controlled crispers, Accubake® advanced temperature management system, self-clean, 30’ electric slide-in range with ceramic glass CleanTop®, “Durawash™” Energy Star® large capacity, multi-cycle dishwasher, large capacity in-sink dispolal, and built-in over the range microwave with integral hood fan are also included as standard features at the new Cornerstone Langley apartments for sale. Did we mention lazy susans and built-in wine rack? The spa-styled bathrooms at the Marcon Cornerstone apartments in Langley real estate market offer a rain showerhead and above-counter vessel sink, and again offer the same clean, square line cabinets with horizontal grain and modern rectangular satin nickel pulls you find in the kitchen. Every new Langley City Centre Cornerstone apartment residence includes a “Hystar” soaker tub by Kohler with a “Waterfall Series” sleek tub surround, finished with 12” x 24” stacked porcelain tile, and modern over-the-basin vanity light bar with brushed nickel finish and “White Opal” cylinder glass shades. Second baths in select Cornerstone Langley condo floor plans feature “Hytec” one-piece shower stalls by Kohler with a 4”x16” gloss finish, designer-selected porcelain perimeter accent tile. Choose from one of three contemporary schemes – and then grab one of our six coloured canvases to choose the accent wall colour to match your lifestyle. When the first phase of Cornerstone Living by Marcon completes this fall (yes, that’s 2011), you’ll see that every new Langley home offers the key things everyone looks for: Security, Safety and Service. The secure and well-lit underground parkade includes emergency panic stations, bog-only access and video. A fob-only access Cornerstone condo lobby with video surveillance, plus intercom with security camera, allows you to pre-screen visitors using your TV. Two high-speed elevators with restricted floor access, the provision for in-suite wireless security systems and stat-of-the-art fire protection system including centrally monitored sprinklers and smoke detectors in every home give you the peace of mind you need. And of course Cornerstone condos in Langley real estate market is technology-ready with additional telephone / cable / data outlets and CAT 5e wiring. All this and a Comprehensive Travelers Guarantee of Canada 2/5/10 new home warranty including two years for materials, five years for building envelope, and 10 years for structural components is included with every new Langley home purchase here at Cornerstone by Marcon. With over 26 years and more than 7500 homes to show for, Marcon Developers has earned their reputation as one of the most trusted builders in British Columbia. Examples of our quality construction and dedication to detail are evident from North Vancouver to White Rock, and Cornerstone Langley real estate development is no exception. You’ll see it in the beautiful exterior stonework, and inside, too, where the little touches like the floating fireplaces and hand-set tile make a subtle, yet remarkable difference. But it’s want you won’t see – their superior rainscreen technology – that adds value to the Cornerstone Langley homes in the long run. Additionally, Marcon Developers include an after-sale Langley Cornerstone Customer Care Program with every home purchase – because they believe that no home owner should ever be left you in the cold. You’re in good company with Marcon Developer – they are committed to creating well-built homes, and to you, the buyer. All this makes living in your home at Cornerstone as enjoyable and worry-free as possible! So whether you are looking for something to move into this year, or later next year, be sure to add Cornerstone condos in Langley to your “must see” list of homes to check out.